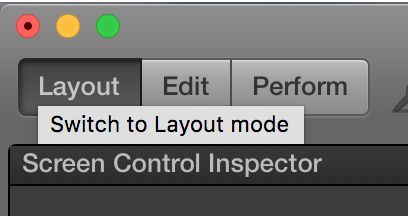 • By assigning MIDI CC controllers at the Layout mode, you can set up your template to always work with your controller by default. Meaning that no matter what controller you’re using, if you send MIDI CC value 17, it’ll always control the parameter you’ve set to be controlled by value 17. • If you assign your controller at the Edit level, MainStage will create a “smart” mapping. For instance, you could theoretically send the same midi signal into MainStage through two separate controllers, and MainStage would recognize that it was two separate controllers and assign them without you having to change the MIDI CC value so that they don’t conflict. Obviously there are advantages/disadvantages to both, and you’ll have to decide what works best for you. 3. Click on the controller you want to map so that there’s a blue ring around it. 4. Click “Assign” then move the controller you want to use. 5. Turn off the “Assign” button, and you’re all set! The biggest advantage to mapping at the Layout level is that no matter what controller you use, if you send a certain midi value, it will always control that same on-screen knob. This works great if you’re tech-oriented and you want to use multiple but identically programmed keyboards with MainStage. For instance, I love using it because I know that all my mappings stay the same when I connect my Novation Zero SL controller and it’s 24 knobs and sliders, no matter what patch I’m using at the moment. There’s also disadvantages, too. If you accidentally send a MIDI CC value it can unintentionally change your on screen parameters, sometimes with disastrous effects. This can often happen if one of your knobs or sliders are broken and sending random midi messages. Also, if you go for this option you definitely don’t want to map any parameters in the Edit mode (other than smart controls) since it’s possible accidentally assign the same controller to control two different parameters, which can create bizarre jumps and jitters. Next week we’ll talk about how to assign in the Edit mode. Thanks!